This meatball marinara naan flatbread is the perfect lighter, fresher substitution to a meatball marinara sub. Perfect for the hot Summer months! I know it’s almost Summer and I should probably be posting a recipe that’s light and fresh, but this girl recently had a major craving for homemade meatballs and tomato sauce! So instead of a plate full of pasta or piling a couple meatballs on top of sub roll with lots of mozzarella, I decided to create a lighter version of a meatball sub in this meatball marinara naan flatbread. Instead of the average size Italian meatball (size may vary depending on your family recipe – I’m Italian so we live large! ), I opted to make mini, cocktail-hour sized meatballs. I have a problem with average sized meatballs. They don’t stay very moist no matter how many family recipe secrets I pack into them! But I think I finally found a recipe that works for me! The trick is using meatloaf mix ground meat. Since it’s grilling season, I fired up the grill to make this flatbread. But you could definitely pop this in the oven during cooler months. I brushed a little olive oil on the naan flatbread and grilled it on both sides. However, you want to work quickly to top your naan when you flip your flatbread so the bottom doesn’t burn to a crisp. I added a thin layer of previously made homemade tomato sauce and shredded mozzarella cheese to the naan, then topped it with my mini meatballs. I also added some of our garden basil for some freshness since we currently have three varieties growing in our garden. This meatball marinara naan flatbread definitely hit the spot! Lightly brush the top of your flatbread with olive oil and place that side down on the grill. Toast your naan until it's slightly crisped and grill marks have appeared. Lower the heat on the grill. Brush other side of the naan and place that side down on the grill. 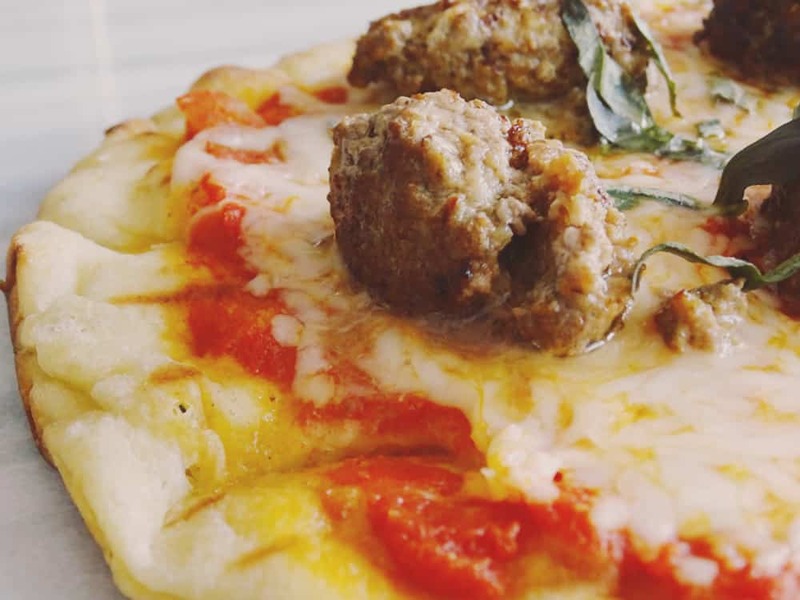 Work quickly to top your flatbread with sauce, cheese, and a few mini meatballs. Sprinkle fresh basil leaves on top, then close the lid on the grill for a minute or two, just until cheese has melted. Season flatbread with salt and pepper and serve. To make homemade meatballs: use a package of meatloaf mix ground beef and combine with 2 eggs, about 1/2 cup or more of bread crumbs, a splash of milk, 2 minced garlic cloves, a generous sprinkle of Parmesan cheese, and salt and pepper. Form mixture into mini meatballs. Then, cook over medium heat in a skillet until all sides are browned and meat is cooked through. Let’s be real. Essentially, this meatball marinara naan flatbread recipe is just another version of grilled pizza, but it’s so much easier to make! One flatbread is enough to split between two for a tasty lunch. Or cut it into sections for when you’re just spending a night on the deck noshing with friends and family. So pour yourself a glass of vino and enjoy! What are your favorite pizza toppings? Do you make grilled pizza? Have you ever had naan flatbread pizza? Wow this looks amazing! I absolutely love naan. Thanks so much! Naan is great! You are seriously speaking my love language right now…!!! This looks amazing! Haha! Thanks so much! I definitely speak that same language! Enjoy! Yum! As an Italian, I think it’s mandatory that I LOVE this recipe idea! Oh, absolutely! You’d be kicked out of the club if you didn’t! ;) Thanks! Yum!! I’ve been craving flatbreads lately and I need to make them since they are so easy! Looks delicious. Super easy! This flatbread was so delicious. Enjoy! What a great idea, I love naan! I love the flavors of this! This flatbread recipe looks delicious! And it’s simple enough for me to make. It’s so easy! I hope you enjoy this recipe! OMG! Flatbread heaven right there! For sure! Thanks so much! Mmmmmmmm never tried meatball on a flatbread before but it sure looks delicious. Definitely give it a try! I’m sure you’ll love it! Thanks! Wish I could grab this right from my computer and eat it for lunch! This looks delish, thanks for sharing! This is great for summer, just a quick heat and you are outta the kitchen. Thanks for partying with us on Creative K Kids Tasty Tuesdays. I always love to see what you share with us. Exactly! And you don’t even need your kitchen to make it if you fire up the grill! Enjoy!